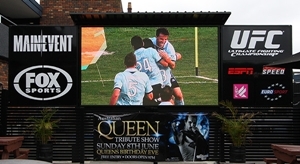 The Manhattan Hotel, Ringwood, installs Melbournes largest Pub Superscreen. The Manhattan Hotel is one of the eastern suburbs oldest and largest pubs. To cement their position as 'the place to go' they recently had ANSO SuperScreens install a 3.5m wide by 2m tall LED SuperScreen. This massive TV screen compliments their large beergarden and is sure to be a big hit with the local punters. They are now screening all the weekly AFL games as well as UFC nights and any other major sporting events being broadcast. This impressive attraction uses a 5mm pixel pitch, SMD LED screen, boasting a 4,000 Hz refresh rate. So every sporting event shown is sharp, clear and stunning with no blurring of fast moving action. The screen is outdoors and needs to contend with full sunlight. No problem, this beauty is capable of 3,000 nits brightness which is around 10 times brighter than a flat screen TV. Meaning all the action is just as clear during the day as it is at night.